A CO Down man is to stand trial accused of murdering an elderly couple in their Co Armagh home last year. Thomas Scott McEntee (41), appeared on Friday at Craigavon Crown Court, sitting in Belfast, for an arraignment hearing on a total of nine charges. 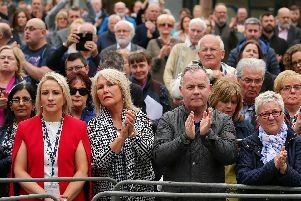 McEntee, formerly of Moorfield Court in Kilkeel, but now with an address at the secure Shannon Unit in Knockbracken Healthcare Clinic in south Belfast, was flanked in the dock by two psychiatric nurses for his hearing. He pleaded not guilty to murdering Michael and Majorie Cawdery at their Upper Ramone Park home in Portadown. The 83-year-old couple were found stabbed to death in their home on May 26, 2017. McEntee also denied two counts of theft on the same date, stealing a bottle of Oyster Bay red wine valued at £8.99, a torch, a compass, a map and a pair of sunglasses. He further pleaded not guilty to a burgling a house on May 25, 2017, at Derrybeg Lane in Newry and stealing a key. McEntee also denied offences of indecent exposure and burgling the home of Mr and Mrs Cawdery with a knife, stealing a Northern Bank cheque book and a set of car keys to their Renault Kangoo vehicle, driving off in the van and damaging it. The defendant pleaded not guilty to a charge of driving the Renault vehicle dangerously on roads including Upper Ramone Park and Killicomaine Road, Portadown on May 26. Defence counsel Ciaran Mallon QC told the court that McEntee had been assessed by a consultant psychiatrist at Knockbracken Healthcare Clinic who said there was “no issue around the defendant’s fitness to plead”. He said that the defence had retained the services of a second consultant psychiatrist to examine McEntee about his “mental capacity at the time” of the offences. But judge Mr Justice Colton said he “didn’t see the necessity” in getting a second report as there was no issue around McEntee’s fitness to plead. The judge set the trial date for Monday, June 18, 2018, and it is expected to last up to two weeks. Rev Gary Galway of Drumcree Church said at the time that the elderly couple had “lived for each other and their family”. He added: “Michael and Marjorie would have attended our church and they were such a lovely couple.